Posted by flashlightblog in Author Signings, Illustrator Appearances, Upcoming Books. The work of Courtney Pippin-Mathur, author and illustrator of Maya was Grumpy (Flashlight Press, to be released May 2013), was showcased in Sendak & Co.: Children’s Book Illustrations Since “Where the Wild Things Are,” an exhibition at the Appleton Museum of Art in Ocala, Florida, that opened this Sunday, November 18, 2012. Read about Pippin-Mathur’s exciting experience at the opening via her blog post. The exhibition runs until January 20, 2013. Posted by flashlightblog in Awards and Honors, Book News, Cats, Illustrator Appearances, Interviews, NY Charlotte Award, Read Alouds. Did you use pictures of real cats to draw from? If I have to draw something I don’t know well, I would always gather lots of pictures of the thing so I get it right. It’s easy to do this nowadays with the internet. I didn’t need to research cats, though, because we have kept cats as pets for years. At one stage we had six, but right now we have just three: a big grey one (very like the big grey cat in That Cat Can’t Stay), a black one and a tabby who is quite old (about 19 years, I think) but very sprightly still. I see them all the time, so I sort of know how they look. Again, I didn’t need to research or gather reference for the people, because I have drawn so many over the years I just seem to know how to do it now. Sometimes, if I need to draw someone in a very difficult position, or they are, say, playing a sport I’m not completely familiar with, I may have to look that up. But I don’t think I needed to do that for this book. Were any of the characters based on people you know? No, I don’t know anyone quite like these characters. Although memories of how someone might have stood, expressions they may have had in certain circumstances, that sort of thing will have informed the drawing. It’s important to be a good observer when you are an illustrator. Always notice how your friends stand, what faces they pull, how they react to things. Then you will know how to draw people in similar circumstances. And you can always exaggerate a bit if you want to make it funny. How long did it take you to create this book? I didn’t get all that long to do this particular book. I think it took about three months to do the final art, but I was doing other work as well. If I had been able to sit and do just the book, and nothing else, it would have probably taken about six weeks. Add maybe another couple of months for the roughs and discussions, so perhaps five or six months in all. Were you responsible for the use of white backgrounds and using text as part of the picture? Sort of. I am given a manuscript, and I know how many pages I need to fill. Sometimes I decide which bit of text will go on which page, and sometimes a designer or editor will tell me (I think that’s what we did with That Cat Can’t Stay). Then I produced a set of rough pencil drawings that went with the text. After I had done that, it was the designer at Flashlight that had the great idea of changing the layout of Dad’s rants, so that sometimes it was boxed like a comic strip, and sometimes the words snaked around the page. She re-sized and re-positioned my sketches to fit, and then I used that new layout when I did the final art. Did you like drawing for a children’s book? I always enjoy doing pictures for children’s books. Well, nearly always. Except when I’m a bit behind with my work, then it just seems like work that has to be done. A bit like homework. We liked the expressions on the character’s faces, esp. the Dad’s. How did you manage to get the expressions right? Remember that thing about watching your friends’ expressions? I’ve been doing that a long time. But also, drawing is a bit like acting. You have to imagine what the person is feeling, and what that would make them look like. And I’ll let you into a secret: when I draw faces I am usually acting the expression that I’m drawing. I sit scowling as I draw a scowl, and grinning when I draw a grin, trying to feel what it is to be the person I’m drawing. When I was doing all Dad’s expressions, I think my wife must have thought I was quite bonkers. Did you mean to have the Dad look harsh? I didn’t want Dad to look harsh, exactly, but he had to look disapproving and completely determined. If he had not, it wouldn’t have been as funny when the rest of the family kept winning, and the cats kept staying. And in the end, we know he’s really an old softy, don’t we? What is your favorite style of illustrating? Such a difficult question. I have done quite a few children’s books, and each time I approach it differently. I always try to make the style of the pictures fit the text as best I can. My favourite style is the one that works best with the writing. But I know that’s not really a proper answer to your question, so I will confess that I do like to draw slightly cartoony characters with lots of energy and exaggerated body language and facial expressions. Like Dad, in That Cat Can’t Stay. I love reading books, but I always feel that I should be working and not sitting enjoying a book because I have so little time. So when I don’t have enough time, I love to listen to audible books. I do that while I work. I find I can listen while I am drawing without any problem, although I can’t if I have to think. So if I am working on roughs, and I’m thinking about the text I’m illustrating, I can’t listen at all. It distracts me. But once all that is done, and I’m just concentrating on the final drawing, I can listen to another book and it’s fine (I really enjoy Charles Dickens). Maybe drawing and listening occupy different parts of the brain. Posted by flashlightblog in Illustrator Appearances. We are proud to share that Jacqui Grantford, illustrator of Wishes for One More Day (written by Melanie Joy Pastor), is celebrating the opening of her one-woman show, A Show of Hands, in Australia. The art exhibition can be viewed now through August 7 at Chapel Off Chapel, 12 Little Chapel Street, Prahan, (03) 82907000 Gallery hours 10am to 5pm. Posted by flashlightblog in Grandparents, Illustrator Appearances. Artist Richard McFarland will demonstrate how he illustrated the picture book Grandfather’s Wrinkles, written by Kathryn England, at the Harvard Diggins Library, on Saturday, February 26th. The event will take place at 2 p.m. at the library, 900 E. McKinley St., Harvard, IL. McFarland, who used himself as the model for the grandpa in the artwork, will read the book and explain how it was made – from initial concept through finished product. His demonstration of how stick figures become printed art will engage children and adults alike. Participants will learn some artistic secrets plus get an interesting behind-the-scenes look at how a picture book is created. McFarland’s presentation is appropriate for all ages, and copies of “Grandfather’s Wrinkles” will be available for purchase. The event is free and open to the public. For information, call the Harvard Diggins Library at 815-943-4671. 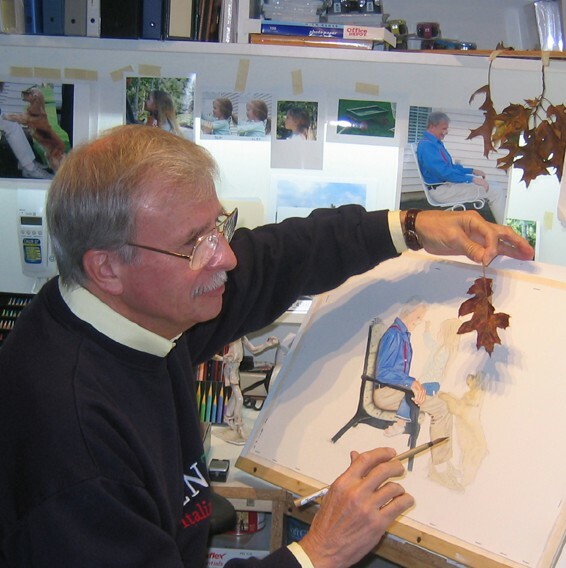 Grandfather’s Wrinkles illustrator Richard McFarland only began illustrating at 70, but he’s helping others start young. Richard’s series of school presentations teach – and inspire – children to draw. Richard’s most recent appearance was at Montini Catholic School in McHenry, Illinois. To read more about this visit from the Northwest Herald, click here. Lori Mitchell, illustrator of Holly Bloom’s Garden, is featured in an episode of Meet Me At The Corner to celebrate Youth Art Month (March). Take a virtual tour of an artist’s studio and creative mind. Be sure to check out our Holly Bloom’s Garden activity pages and craft guides.